Accidents that result to a chipped tooth are common. Perhaps, you fell face down or bit hard onto something you shouldn’t have. In other cases, the reason is a natural occurrence that comes with poor oral health care, such as cavities or tooth decay. While there could be many ways for your tooth to be broken, there are also, fortunately a couple of ways for you to get it back in shape. As the leading source of comprehensive and high-quality dental services in Richardson, Texas, at ORCHID Family Dental, you have all the options you need to get back your perfect toothy smile. As the name suggests, veneers are basically a covering for your tooth. The most common type of veneer used in any dental clinics is a porcelain veneer due to its realistic appearance. Not only are veneers an option to fix a chipped tooth, they are also used to mask discolored fillings on the surface of the teeth, fill the gaps in between teeth, or alter the size and shape of the of the tooth. Dental veneers have many different uses, especially in cosmetic dentistry. However, if you are someone who grinds teeth out of habit, it may not be the best option for you. Some cracked or decayed tooth needs root canal treatment. In this procedure, the dentist will place a crown over the crack to keep it from spreading and exposing the pulp. There’s an important reason why root canal is needed, unless extracting is a more advisable option. If you leave a damage tooth – one that has given you pain or swelling – untreated, it may cause further infection and other severe dental problems, such as abscess and bone loss. Bonding is one of the relatively painless solutions for repairing chipped, discolored, gapped, or decayed tooth. It’s the easiest and the least expensive procedure that can last for up to ten years. This simple procedure includes placing a special tooth-colored resin on the damaged tooth, molding it into the perfect shape, and hardening it with the use of a special light. This is a dental solution that is both for cosmetic and restorative purposes. If the crack has already reached below the gum line, there is practically no way to salvage that tooth. Tooth extraction is the only plausible solution. Once your tooth is pulled, you can have it replaced with a dental implant, which will not only fill the empty space but also act as the tooth’s new root. When the tooth is severely damaged, it’s possible that either bonding or veneer is no longer enough to fix it. In this case, a tooth-shaped cover will be placed over the broken tooth to completely conceal the damage. Crowns may also be used to conceal discolored or misshapen teeth. Losing or breaking a tooth is not the end of the world. You still have a variety of options to recover your perfect toothy smile. Get back your confidence in smiling with the help of the most advanced and effective dental care services we offer at ORCHID Family Dental. 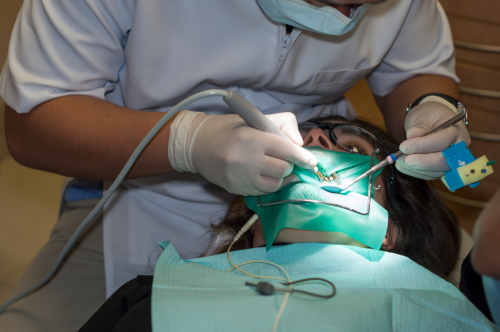 As the leading provider of dental services in Richardson, Texas, we use state-of-the-art products and equipment in giving you all the quality and cost-effective dental care services you need. Find out more about our services or schedule an appointment with us at www.orchidfamilydental.com. This entry was posted in dental, dental care, dental sevices, general dentistry, oral health and tagged cosmetic dentistry, dental care, dental health, oral health. Bookmark the permalink.